Three sweet new items have hit the menu, just in time for summer. Summer is just around the corner, and if you've been wondering what your new indulgence will be for 2018, Starbucks has a few richly flavored takes on two of its classic frappuccino flavors to tempt you. Yes, you might have seen the announcement that Starbucks would be scaling back on limited time offerings like Unicorn and Zombie drinks, however, these two new multi-layered frappuccino options and their sweet topping are hitting the menu permanently. Not only that, the Ultra Caramel and Triple Mocha frappuccinos and Sweet Cold Brew Whipped Cream hit said menu today. Here's a look at Starbucks first cold concoctions of the summer. First, you'll need to get acquainted with Sweet Cold Brew Whipped Cream, an ingredient in both new beverages as well as brand new modifier you can add to any other drink you please for just fifty cents. The whipped cream topping is infused with Starbucks Cold Brew, as well as two of the brand's sauces—white chocolate and the new dark caramel—which supply the sweetness. The layering of all three (four if you count the cream) flavors creates a subtly sweet, coffee-hinted cloud that definitely feels a bit more decadent than standard whipped cream. The topping is a joining the menu along with another recent addition, Cold Foam, which just debuted last month as a way to finally get the cappuccino-like experience on iced beverages. Now, on to the frappuccinos! The Triple Mocha Frappuccino is an upgrade of the OG mocha frappuccino which was introduced back in 1995. This new iteration starts (from the bottom of the cup, up) with a layer of Sweet Cold Brew Whipped Cream, a drizzle of dark mocha sauce, then the classic mocha frappuccino topped with more Sweet Cold Brew Whipped Cream and another hit of dark mocha sauce to finish it off. 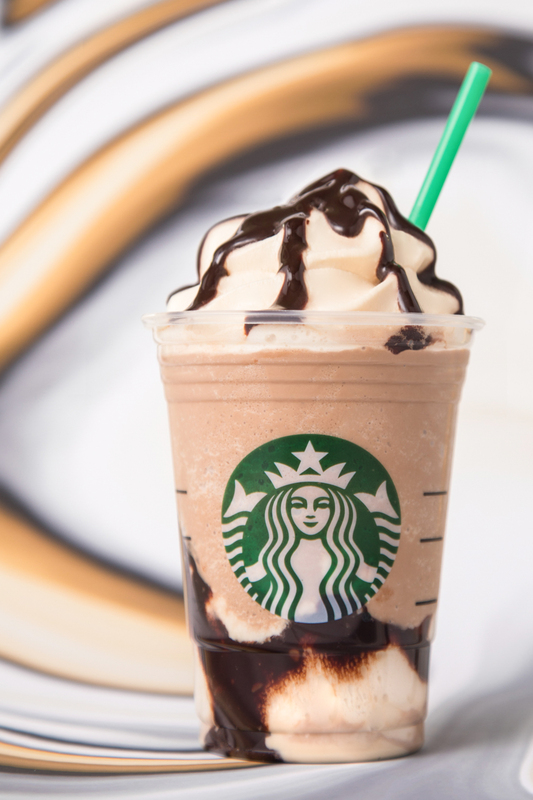 The result is a richer chocolate flavor, plus an airier texture while you sip from the middle of the cup thanks to the whipped cream mingling with the frozen frappuccino portion. The Ultra Caramel Frappuccino is layered-up take on the classic caramel frappuccino that you've come to know and love since 1999. Like the Triple Mocha, it starts with the Sweet Cold Brew Whipped Cream, then a drizzle of new dark caramel sauce—which has a nuttier, less sticky-sweet flavor than normal caramel sauce—followed by the caramel frappuccino beverage, and once again topped with more of the cold-brew-infused whipped cream and more drizzle. If you're itching to try either of these, of course, you can run down to Starbucks this morning and do just that. 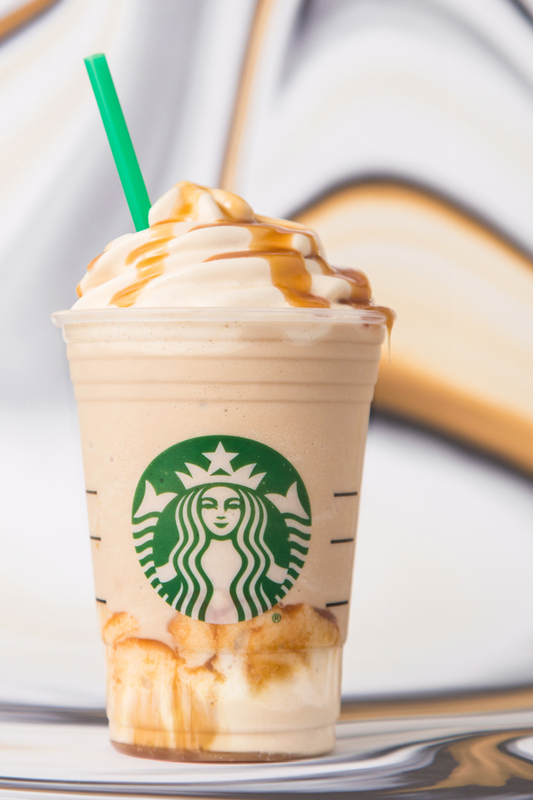 But on the afternoon of Thursday May 3, Starbucks' Happy Hour promotion is back and the drink of choice is—you guessed it—frappuccinos. If you're signed up to get promotions from Starbucks, you'll be able to snack any grande or venti frappuccino for half off after 3 p.m. Yes, that includes the classic mocha and caramel frappuccinos if you're a purist, or the new Triple Mocha and Ultra Caramel if you're a bit more adventurous.